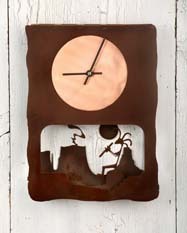 Our selection of southwestern clocks bring a warm, rustic feel to your home with their whimsical portrayal of popular images from the southwest: an adobe village, a coyote howling at the moon and the ever-delightful flute-playing Kokopelli clock. The southwest clock pictured above is the Adobe clock which portrays a serene Adobe village. Other styles appear below. Each clock is made to order by our artists. Please allow four weeks for delivery. Since each piece is individually made, variations in finish may occur. 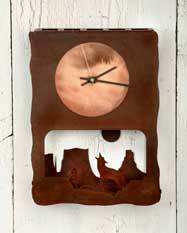 This is what gives your southwestern metal wall clock an artist's touch. Southwestern clocks are made of steel. Measurements are 12 inches high x 8.5 inches wide. Uses a AA battery. Reserve your southwestern clock today.